Implementing best practices across portfolios, we empower managers and directors to retain control and confidence in the progress of their projects, making capital projects a source of excitement and growth — not anxiety and risk. Whether you are an individual or a group, we offer extensive services to align with your needs, spanning the full capital project life cycle. This is where it begins. Integrating those CII best practices which are proven to drive increased performance. The 2010 CII Value of Best Practices Report showed that Owners with a high use of CII’s core best practices realize a 7.5% cost improvement, and 9.7% schedule improvement compared to Owners with a low use of the same practices. Valency supports organizations in successfully implementing and gaining value from new practices and tools in construction project management. Our advisors follow a proven, systematic approach to implementation with a consistent focus on managing organizational change throughout the entire process. Needs Analysis. Successful implementations begin by accurately defining the business case for the new practice and clearly articulating this need to your stakeholders. Preparation. Introducing a new practice often results in changes. We evaluate the organizational impact of those changes, evaluate change preparation areas, and help you communicate those changes in a manner that minimizes resistance. Pilot. Demonstrating that a new practice will deliver value is critical. In most cases, we recommend starting with a limited use pilot group or proof of concept that allows you to demonstrate that the new practice can achieve the intended benefits. Growth. Building upon the success of the Pilot, we help you expand the use of the new practice beyond the pilot group to larger projects and additional groups or divisions. Standardization. Often the most challenging but rewarding step is achieving standardized use of the practice broadly across the organization. Benchmark. Every implementation should include a plan for measuring the performance impact of a new practice, and collecting the data needed to support benchmarking. No agenda, just peace of mind. Our roster of expert facilitators are passionate about helping capital project teams achieve success. Our facilitators combine hands-on capital project experience with world-class facilitation skills to serve as a trusted, neutral third-party. PDRI Assessments. Valency’s Certified PDRI Facilitators are experts in the facilitation of PDRI assessments worldwide for industrial, infrastructure and building projects. FEED MATRS Assessments. Our Certified PDRI Facilitators serve as expert facilitators of FEED MATRS assessments for large, industrial capital projects. Flash Track Readiness Assessments. When faced with an emergency rebuild or immediate regulatory compliance, a flash track (faster than fast-track) delivery strategy may be your only option. A Flash Track Readiness assessment conducted at project kick-off is a proven strategy to establish a flash track philosophy and identify capacity gaps. Interactive Planning Workshops. Our Interactive Planning facilitators leverage decades of construction management experience to lead your team in establishing the path of construction. Risk Workshops. Our consultants facilitate both qualitative and quantitative risk workshops for major capital projects spanning the mining, energy, oil & gas, pipeline and public sectors. Partnering Workshops. Valency facilitates partnering workshops to assist Owners and Contractors in establishing partnering success criteria, project objectives, performance measures, communication and dispute resolution plans. To achieve substantial performance improvements, a formalized Phase Gate process is a foundational element. It is the only approach in the capital projects industry proven to work over the long term for $100M+ capital programs. The project life cycle is not just another process. Throughout a project’s entire life cycle, various resources and capabilities come together for a temporary purpose, toward a common goal. At Valency, we believe capital projects should be a source of excitement and growth — not anxiety and risk. Providing tested services and informed thought leadership, we restore cost and schedule certainty to the capital project, empowering directors and managers throughout the entire project life cycle. Our life-cycle approach equips capital project teams to navigate the most significant barriers to project completion, keeping the project lean, agile, and adaptable to new variables. We restore certainty and predictability to that process through careful front-end planning principles and practices. When a project is thoughtfully initiated, resources are more effectively deployed, teams are more engaged, and risks are minimized. We offer a suite of end-to-end solutions and resources, including software tools, methodologies, and industry expertise to help organizations keep their projects streamlined, on track, and predictable. Our team excels in assessing an organization’s overall process for managing projects and making recommendations to overhaul that strategy to ensure capital project readiness. Assessment of your existing front end planning practices to identify opportunities to streamline and improve scope definition. We utilize the Construction Industry Institute’s (CII) Front End Planning best practice as our basis of assessment. Development of procedures, forms, checklists and templates to improve standardization and effectiveness of your front end planning practices. Alignment Thermometer The Alignment Thermometer is a survey tool used to help your project team identify and improve their performance in critical areas of alignment. The survey consists of ten simple statements related to project execution processes, culture, information and tools. Shutdown Turnaround Alignment Review (STAR) STAR tool provides a method of assessing the alignment and preparedness of multiple projects to move forward into detailed design and execution of a shutdown, turnaround or outage (STO). Front End Planning Toolkit The Front End Planning (FEP) Toolkit provides a visually-engaging representation of each phase of the front end planning process. We work with clients to customize dashboard templates to visually communicate the steps in your front end planning process, along with applicable tools and templates. Introductory training on AWP best practices, including the roles and responsibilities of the owner, engineering, procurement and the contractor. Assessment of your existing workface planning practices and information management tools to identify and prioritize changes needed deliver projects using AWP. Facilitation of Interactive Planning Workshops to establish the path of construction for your project. Our facilitators leverage decades of construction management experience to assist your team in identifying and sequencing a complete list of construction work packages. Assessment of your existing risk management practices to identify opportunities for improvement. We utilize the Construction Industry Institute’s (CII) Risk Assessment best practice, combined with the Project Management Institute’s (PMI) Practice Standard for Project Risk Management as our basis of assessment. Development of procedures, risk register templates and risk identification checklists to improve standardization and effectiveness of your risk management practices. Probabilistic Risk Register A risk register toolset designed to help project personnel maintain an effective risk register appropriately based on project complexity. The toolset is aligned with CII best practices to support both qualitative (deterministic) and quantitative (probabilistic) risk management. Risk Identification Checklist A comprehensive Risk Identification Checklist developed by Valency with over 150 of the most common risks in capital projects, compiled from 27 CII publications. This checklist can help augment your existing checklist, or start an internal risk identification checklist for your organization. Integrated Project Risk Assessment (IPRA) IPRA is a structured risk identification tool that is ideal for large capital projects in unfamiliar jurisdictions. This facilitator-led tool helps a project team review common risk issues related to commercial, country, facilities and operations. Facilitation of Risk Workshops. Our team has facilitated over 100 workshops for a wide range of project sizes and industry sectors. Quantitative cost and schedule risk analysis. Our team of analysts has completed quantitative risk analysis using @Risk Monte Carlo simulation for capital projects valued at over $60 Billion in the mining, energy, oil & gas and pipeline sectors. Implementation of the Project Health Indicator, an assessment tool that helps project teams identify potential project health issues early in detailed design and construction. Leading indicators that are proven predictors of project success through CII research complement traditional “lagging” project control metrics. Development of procedures, internal benchmarks, process automation and checklists for leaner and more reliable project controls processes. On-time delivery of capital projects is a key priority for most owner organizations. We strive to start construction on schedule, in spite of delays in Front End Planning or delays in the completion of design deliverables. However, this can lead to premature construction starts which are the source of costly interruptions and holds during construction. Premature starts adversely affect overall project cost, schedule, productivity, and introduce costly rework and change to the project. 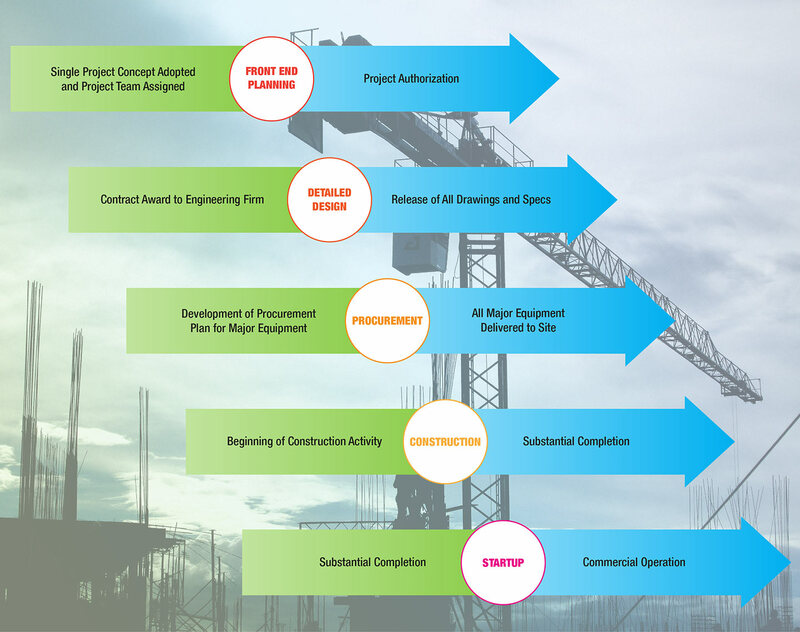 The Construction Readiness Assessment (CRA) supports a comprehensive assessment of the activities and procedures that should be completed (or substantially complete) prior to construction in order to productively start and sustain construction operations throughout the project timeline. 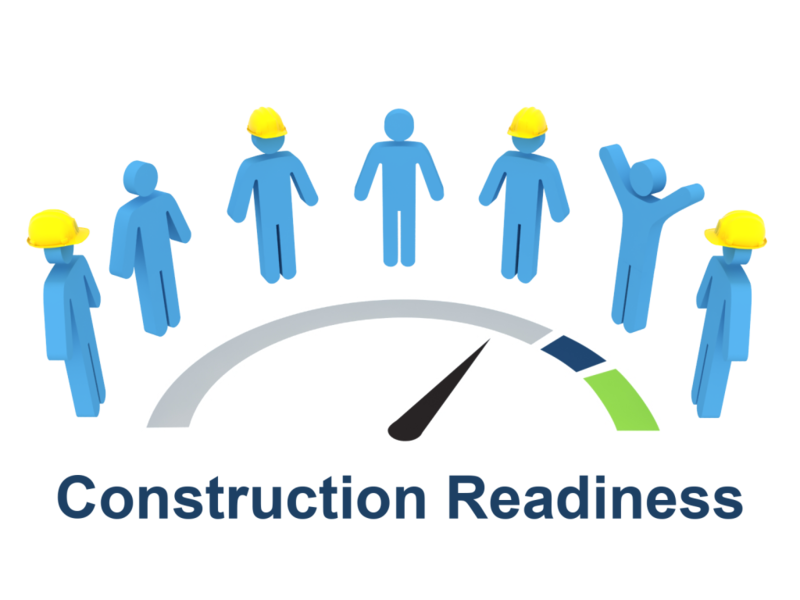 Valency provides implementation, training, and facilitation support for the Construction Readiness Assessment. Development of implementation strategies for productivity improvement practices, depending on the phase of the project, objectives, and project conditions. Facilitation sessions for assessment of productivity practices and identifying productivity barriers using BPPII, construction readiness, workface planning, and others. Valency uses this process as an enablement practice for its clients; not only to train and mentor them in baselining and measuring their craft productivity, but also to enable them to continue implementing this practice internally in their organization using the process, tools, and resources provided. Alignment between the Commissioning, Project Management, Operations, Engineering, and Construction representatives on commissioning and startup issues. We build certainty into your Capital Project Life Cycle.